Here, involve yourself in sound. Speak up, ring out . . . and listen for the hidden harmonies of this place. 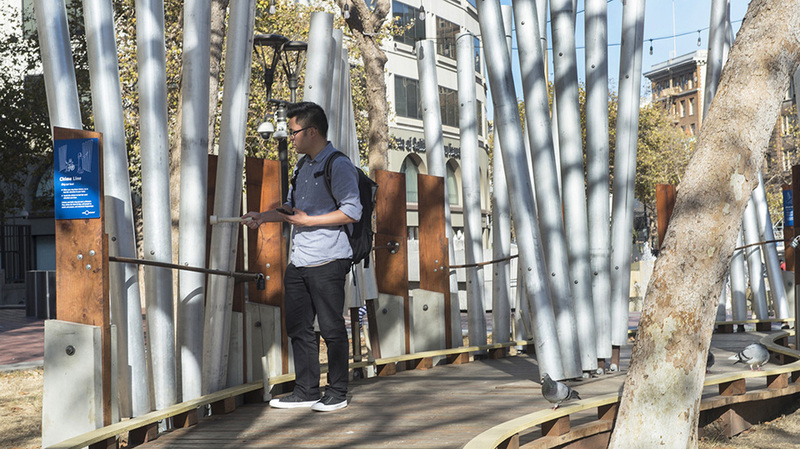 Sound Commons is our most prominent public space installation yet. 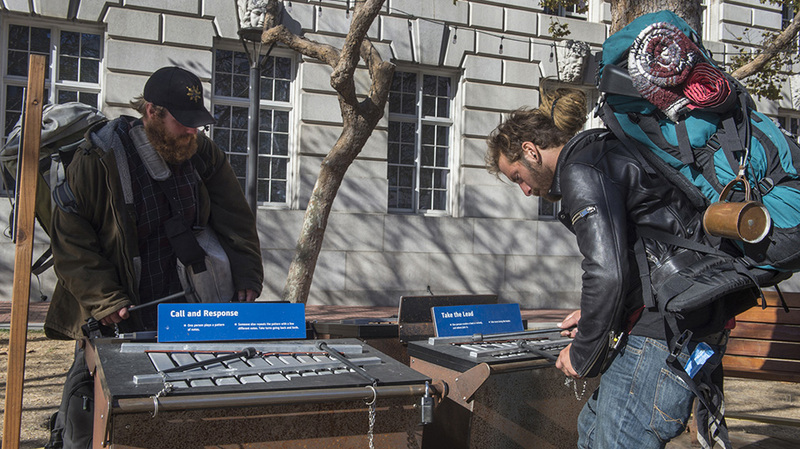 It enlivens San Francisco’s UN Plaza, inviting people to leave the formal pathways and try out a collection of sound-making and sound-related experiences. The new space was created in partnership with San Francisco’s Office of Planning, and is the latest project built under the city’s Living Innovation Zones (LIZ) initiative. SPS is increasingly involving itself in such collaborations with city agencies and community groups to develop public spaces that achieve multiple goals: supporting inquiry, improving public health and safety, and making the city more livable. UN Plaza is a challenging space. Its design is formal and rather grand. 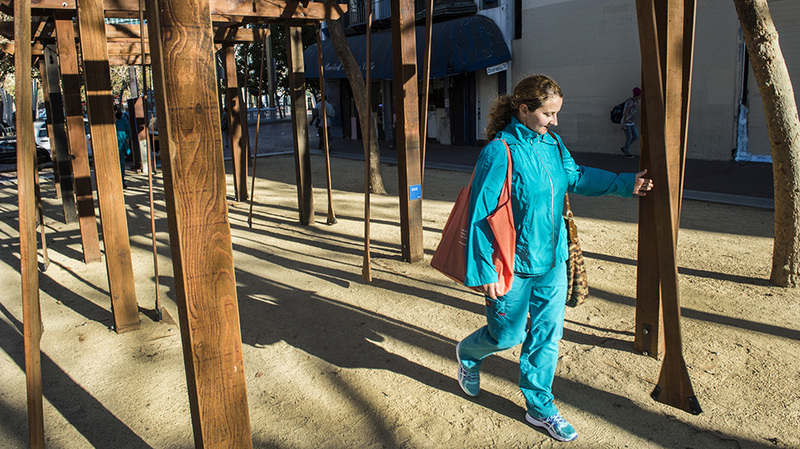 Its usage epitomizes some of San Francisco’s most intractable social challenges. Through it runs a constant stream of city dwellers from all walks of life. Typically, Exploratorium exhibits are designed to engage people in observation, curiosity, and experimentation—the process of inquiry. But in a space like UN Plaza, our social and civic goals were just as important. We wanted to increase people’s sense of safety and comfort and encourage them to engage with others, even strangers. Working with our partners in the city, we hoped to help transform a problematic public space, prototyping ideas for the future of our city. For such an experiment, sound seemed like a useful focus. Sound evokes memory and emotion; it’s used for communication and self-expression. Bells and chimes have long been used to call people together, and music is a proven community builder. Plus, making sound is good, active fun. Drawing on existing Exploratorium exhibits, we created five sound-related elements: Chime Line, Echo Tubes, Xylophones, Shhh . . . Quiet, and Tick-Tock Walk. 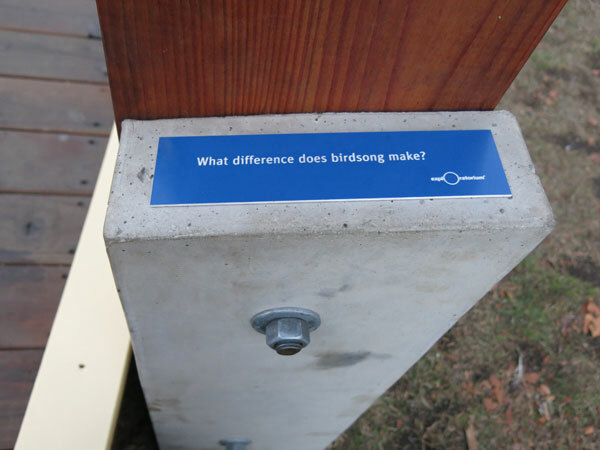 As people engage with these activities, sending new sounds out across the space, they’re also changing the tone in the plaza, adding a more positive vibe. Still, transforming UN Plaza takes more than physical objects, no matter how engaging. Sound Commons is staffed every day, all day, by two stewards from the Hunter’s Point Family who have been hired to talk with people about the exhibits, answer questions, and keep things tidy. They’re joined by the Downtown Streets Team, which also helps ensure the plaza is clean and graffiti-free. The installation can be played and heard in UN Plaza for two years, until the summer of 2018. This forest of 62 chimes sounds a new tone for UN Plaza. With many people playing them at once, their resonant notes ring out across the space. Sometimes no sound is what you want. At this exhibit, try to walk as quietly as possible across a bed of gravel. The gravel is studded with sound sensors, and each crunch adds unwanted points to your score on the monitor. Watch others, then see if you can beat their score. Where: This exhibit is not currently on view. Amble through a passageway of pendulums and set them in motion to create rhythms both visual and sound-based. Each swinging leg makes a clonky tick-tock noise; together, the sounds evoke a shop full of clocks, or the busy footsteps of a city. Experiment with echoes with these three long tubes. Why does a clap come back as a ping? What does it take to make a good echo? Keep an eye out for these little notes on the nature of sound. You might never hear the city the same way again. Solo, duet, or full quartet, this collection of four xylophones lets you play alone or join in with others. Try out different sounds, trade off riffs, or collaborate to keep a beat. Tuned to a C-major pentatonic scale, the xylophones are designed to sound good together. Sound Commons, a new SPS installation, is taking shape in UN Plaza. The city of San Francisco chose the Exploratorium to develop this site as a model for how to revitalize an urban space. We helped local residents envision a safe, green, well-used park—and then build it. This parklet exploring the science of water lives outside a school in SF’s Mission neighborhood.